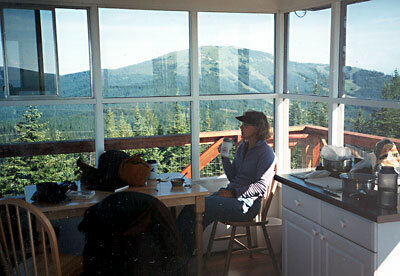 The Quartz Mountain fire lookout is now available for summer overnight rental! Perched at an elevation of 5,129 feet, the view of the Spokane valley and the North Idaho panhandle is incredible. The lookout sleeps a maximum of four and has numerous amenities for a very comfortable night’s lodging. 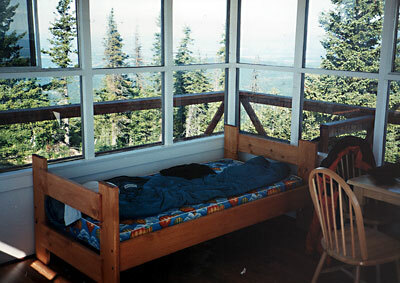 If you want to spend a night in the Quartz Mt Lookout this summer, call Central Reservations at 1-888-226-7688. The season usually books out very quickly so be sure to call for your reservation early on March 1. 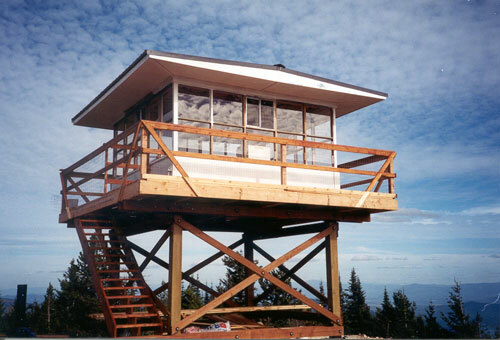 The 14' X 14' wood frame lookout was originally built on the summit of Mt. Spokane in 1979 by the Washington Department of Natural Resources (DNR) using a 40' wood tower. It was actively used for spotting fires until 1994, when it was permanently closed. The lookout represents the end of an era on Mt. Spokane which started in 1934 with the construction of the Vista House and the attached fire lookout at its north end. 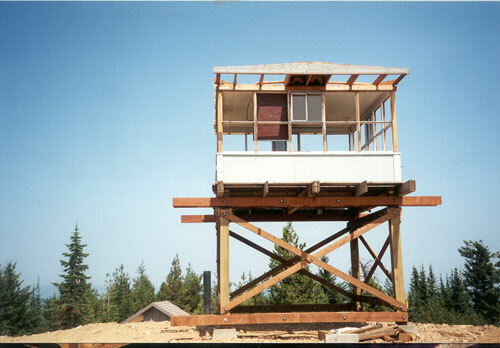 In 1948, an 85' wood tower lookout was constructed, but it collapsed during its first winter under the heavy snows. A new 45' tower was built in 1950, and then it was replaced in 1963. 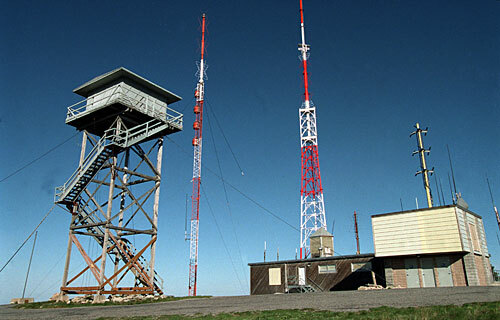 During its 60 years of service, the Mt. Spokane lookout held the record for more reported wildfires than any of the other 657 fire lookouts in Washington. But the Mt. Spokane structures also had to endure the worst icing conditions of any fire lookout in the state, and eventually the DNR decided it could no longer afford the constant repairs, for what it believed to be an obsolete technology. The lookout was destined for demolition until the Park staff and the Advisory Committee requested that it be given to the Park. With much Advisory Committee input, it was decided that the lookout would be best utilized as a recreation rental cabin, but that it should be moved to the top of Quartz Mountain, the rocky summit just to the southeast of Mt. Spokane that was purchased by State Parks in December of 1999. The Committee was convinced that moving the lookout well away from the paved road and busy transmitters on the summit would make for a much higher quality experience. The plan also includes maintaining the ability to use the structure for spotting fires by trained personnel during “red flag” summer conditions. The historic fire finder is being preserved so that it can be reinstalled if needed. But the more remote location also means that renters will need to make the 2.25 mile trek from the Selkirk Lodge under their own power. Since Quartz Mountain is about 700' lower in elevation, and since the lookout is now sitting on only a 10' tower, it is expected that the icing problems will be greatly reduced. It might therefore be possible to eventually utilize the cabin during the winter. Since the DNR had already budgeted funds for its destruction, the agency simply gave the Park the lookout and the budgeted demolition funds to do as it pleased. So in June of 2001, crews scrapped the tower after removing the 9000 pound cabin with a crane, and moved it by truck to a storage area in the Park where it remained until the end of August, 2004. In late August of 2004, a state parks maintenance crew made the old road passable for heavy trucks, poured 4 concrete pillars, erected the tower, and prepared the site for the CXT vault toilet. When the toilet was delivered, it was decided that the same truck with its boom crane would attempt to transport the lookout and lift it to the top of the tower. Two sides of the catwalk and roof were cut off of the cabin and the windows were removed in preparation for its trip up the steep and narrow mountain road. The boom was stretched to its maximum, but the plan worked and the cabin was bolted into place! During the first part of September, the crew worked feverishly, often in inclement weather, to restore the roof, the catwalk and the railing, insulate the ceiling, and build an access stairway. Once the basic structure was in place, Jim and Linda Frey, the volunteer campground hosts, took the responsibility to complete the reconstruction. Jim is a retired Marine and home builder with many years of construction experience, and he took on the project with gusto. The immediate goal was to get the structure closed in so it would survive the harsh winter conditions. The Freys and a handful of other volunteers (including Bill and Eunice Birk, Cris Currie, Carol Ann Christensen, and Ray Kresek a retired fire spotter, fire fighter and author of “Fire Lookouts of the Northwest”), along with Park staff, were able to complete this task in early October just before the weather turned colder. They pulled out the moldy carpet, cleaned mold off of the walls, hand installed 34 Lexan windows, got an initial coat of paint on the exterior and stain on the catwalk, wrapped the walls in plastic, nailed on the shutters, closed in the stairway, and cleaned up the site. Lightning protection was also installed. Then in June of 2005, park staff were busy finishing the window moldings and caulking, finishing the ceiling, painting the interior and exterior, installing the laminate wood floor, hanging a door, and purchasing and installing the cabinet, chairs, new screens, propane stove, bunks and other interior furnishings, as well as a plastic 65 gallon tank for storage of cooking and wash water. Commercially bottled spring water is being provided for drinking. There is a picnic table and fire grate nearby with firewood supplied. The fee is $50 per night but a small discount will be in effect for the first season. Reservations and complete details on items not supplied, arrangements for picking up and dropping off the key, directions, and parking are available from the park office. Call the office at (509) 238-4258 for more information and reservations. 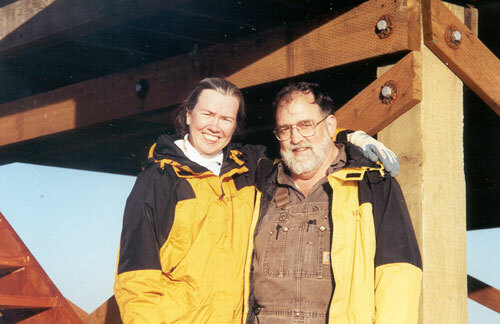 Then Jim and Linda Frey, the volunteer campground hosts, took the responsibility to complete the reconstruction. Jim is a retired Marine and home builder with many years of construction experience, and he took on the project with gusto. The immediate goal was to get the structure closed in so it would survive the harsh winter conditions. The Freys and a handful of other volunteers (including Ray Kresek a retired fire spotter, fire fighter and author of “Fire Lookouts of the Northwest”), along with Park staff, were able to complete this task just before the weather turned colder. They pulled out the moldy carpet, cleaned mold off of the walls, hand installed 34 Lexan windows, got an initial coat of paint on the exterior and stain on the catwalk, wrapped the walls in plastic, nailed on the shutters, closed in the stairway, and cleaned up the site. Lightning protection was also added. Jim and Linda Frey, the volunteer campground hosts, took the responsibility to complete the reconstruction.